The Lopez Family Foundation International Telehealth Program provides specialized health care services to approach the needs of children globally -- with an initial focus in Latin America -- through innovative videoconferencing technology. The first collaborations between Children’s Hospital Los Angeles' Center for Global Health - International Patients and the Lopez Family Foundation focused on establishing a telehealth presence in Puerto Rico and Panama. University Pediatric Hospital Dr. Antonio Ortiz - This medical center is the main pediatric referral center for the island and the Caribbean region. San Jorge Children’s Hospital - This hospital serves as a secondary referral center for some of the most seriously ill children in San Juan and throughout the island. Through close collaboration between our hospital and the hospitals above, Radiology and Genetics services emerged as two areas where our expert teams could have the greatest impact on the health of critically ill children within Puerto Rico. To provide patient care, physicians used telemedicine technology to diagnose medical conditions, speak with patients and families when needed, and participate in collaborative case discussions with local clinicians. Our doctors also used the same infrastructure to collaborate on case discussions, training sessions and broadcast lectures. Linda Randolph, MD, Division Head of Medical Genetics, conducted detailed history taking and used digital ophthalmoscopes and stethoscopes connected to state-of-the-art telehealth stations to review digitally sent patient medical records for remote review and testing, which allowed her to provide accurate diagnosis and treatment plans for patients thousands of miles away. In addition, we partnered with a local laboratory to perform genetic testing. This allowed patients in Puerto Rico the opportunity to benefit from our expertise in new medical developments and discoveries, including, for example, chromosomal testing. Dr. Randolph provided a bi-weekly tele-genetics consultation to children in Puerto Rico. Puerto Rico suffers from a dearth of pediatric radiologists, which in some instances can mean that interpretations for complex cases are delayed. In an effort to alleviate this issue, the Lopez Family Foundation teamed up with Children’s Hospital to assist pediatric radiologists on the island by providing remote second-opinion consultation for complex cases through telemedicine. The Tele-Radiology program also provided medical training for radiology residents at the University of Puerto Rico Pediatric Hospital. Monthly archived case review sessions with local radiology residents and staff — as well as regularly broadcasted lectures — helped raise their level of expertise and exposed the teams to new medical topics across different specialty areas. Tele-Education was another major focus of our telehealth program in Puerto Rico. Children's Hospital physicians who have academic appointments as faculty at the Keck School of Medicine of the University of Southern California, provided educational lectures on specific topics chosen by the residents in accordance with the residency curriculum in our partner hospitals and the American Academy of Pediatrics’ learning objectives. These lectures were conducted live like a “virtual classroom," which allowed residents to interact with prominent faculty at Children’s Hospital just like they would in an in-person classroom. In addition, these lectures were recorded for residents who may have missed the live lecture and could thus be used by future program partners as a resource. The recorded Pediatric Board Review sessions can be found in the Lopez Family Foundation Health Video Library with limited access to partners. Hospital Del Niño - This medical center is the main pediatric referral center in Panama. 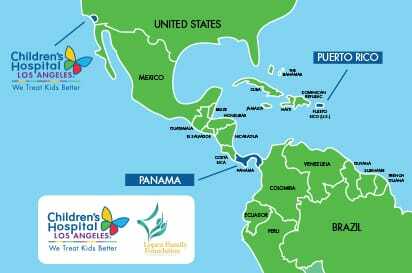 Specialty Children’s Hospital - This hospital serves as a secondary referral center for some of the most seriously ill children in Panama City and throughout the country. Hospital Obaldia - This medical center is the main pediatric referral hospital in the West of Panama located in the City of David, Chiriqui. Seriously ill children coming from the remote regions of Comarca Ngobe-Bugle are treated and cared for in this hospital. Hospital San Felix - This rural hospital provides primary and general care for the indigenous population of Comarca Ngobe-Bugle. Cases that cannot be treated or cared for at the rural health clinics are referred to this hospital. Three Rural Health Clinics - Hato Juli, Hato Chami, and Cerro Iglesias are the three rural clinics providing basic health care services to the indigenous population in the remote regions of Comarca Ngobe-Bugle. Similar to our Puerto Rico program, Children’s Hospital provides monthly keynote lectures to the medical community including specialists, primary care providers, fellows, residents and interns working at our partner hospitals in Panama. The topics are chosen by Panamanian physicians. The keynote lectures are also recorded and archived in the Lopez Family Foundation Health Video Library, with limited access to our partners. Children’s Hospital and Panamanian physicians participated in case conferences on an ad-hoc basis to discuss complex, interesting and unusual cases to develop the most appropriate treatment plans. Case conferences organized with multidisciplinary teams from both hospitals coming together conveniently using telemedicine technology. In May 2013, the American Telemedicine Association (ATA) awarded Jennifer Lopez and the Lopez Family Foundation with the first-ever Humanitarian Award for their efforts in telehealth through their partnership with Children’s Hospital Los Angeles.